A diagnosis of kidney cancer does not mean that your are at the end of the road. There are innumerable stories of courage, innovation and determination that can inspire us. Fortunately, with modern technology and treatment techniques, there is hope for the vast majority of people who would not have been treated effectively till just a few years back. One such story, is that of a surgical colleague of mine, a plastic surgeon in Iraq, who had came over with his father to me a few months ago. 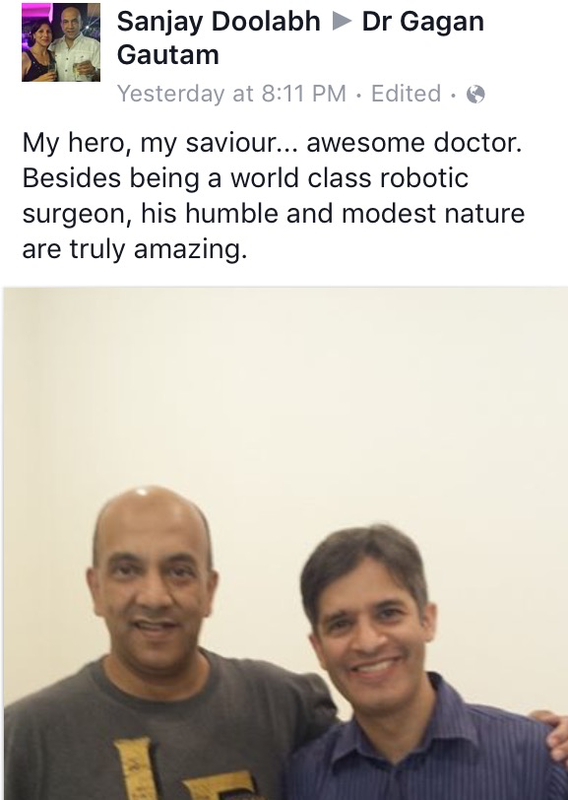 What follows is an extract from his post on http://www.facebook.com/roboticsurgerydelhi. You can read his post through a link at the end of this blog. There is always light at the end of the tunnel….recovering well after surgery…..
“Everyone may face a hard time, and during that, you have to know who will be there with you to pass it. My father Safaa Alhassany is 67 year old with past medical history of angina, hypertension, gout and DM. We discovered accidentally that he had a big tumour in the middle lobe of his left kidney and to make it complicated, the right one was shrinkage and with only 12% function!! Which meant a real ((disaster))!! After a lot of consultations there in my country and here in India, there was no doubt that we are going to the dark side of our life.. There was no choice other than nephrectomy due to the size and site of the tumour. 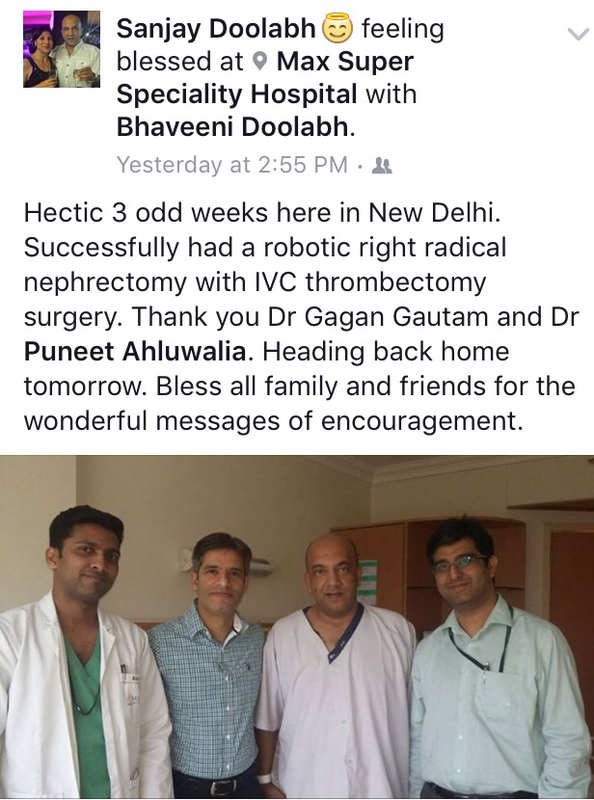 Thanks Godness, following someone’s recommendation, I met Dr. Gagan Gautam and he was the only one offers a partial nephrectomy to save the kidney and get rid of the mass. Within a week time, he bravely took the plunge and operated on my dad and thankfully did it, saving about a half of the kidney after a super-major, long and difficult operation lasted more than 5 hours.After a month of this nightmare, I write my story just to say thank you to the one who saved our family Dr. Gagan Gautam and to let the others know that the hope is usually there but you have look for it carefully. Dr. Gagan Gautam is the Head of Urologic Oncology & Robotic Surgery at Max Institute of Cancer Care, New Delhi, India. He is India’s leading expert in robotic surgery for prostate, kidney and urinary bladder cancer treatment. To know more about him, click here, or visit his website http://www.roboticsurgerydelhi.com. To read Dr. Gautam’s blog on robotic surgery for kidney cancer, please click here. Hi tech robots performing complex operations on human beings through miniaturised instruments may sound like the stuff science fiction is made of …but it may be closer than you think. In fact, it is already here! Robotic surgery has now entered the second decade since its inception around the turn of the century, and is now all set to revolutionise the way complex surgeries are performed. There are over 2000 surgical robots in the world today (>1500 in the US, ~ 20 in India) and they are increasingly being employed for the surgical treatment of cancers in India and abroad. The most advanced robotic surgical system in the world today is the Da Vinci system developed by Intuitive Surgical (Sunnyvale, California, USA). It comprises of a console, patient side robotic machine and another cart, which houses the display monitor and lighting equipment. The surgeon sits at the console and through futuristic “master controls” initiates and controls the movements of robotic arms, which translate the movements of the surgeon to the robotic instruments inside the patient’s body. This system affords extremely precise and delicate movements made possible by the extreme miniaturization and flexibility of these special robotic instruments. Surgeon tremor is completely eliminated and the movements can be scaled (3:1) for greater finesse. Accompanying these advances in instrumentation, is the superb high definition magnified 3D vision of the operative field that the surgeon gets while sitting at the console of this robotic system. This enables the surgeon to see and appreciate minute structures inside the human body thereby making surgery potentially safer and more complete – aspects, which can be vital to a cancer patient. Surgery for prostate cancer (robotic prostatectomy) is by far the most common cancer operation performed with robotic systems in the world today. Another condition in which the application of robotics is being considered a big step forward is – kidney cancer. Although relatively rare, kidney cancer is unique in being almost 100% curable if detected at an early stage when it is confined to the kidney and almost 100% fatal if it is detected at a stage when it has spread to other parts of the body. Kidney cancer treatment success rate is very high at early stage of the disease and very dismal at a late stage. Moreover, radiation and chemotherapy have been shown to be quite ineffective in this disease thereby leaving surgery as the only effective treatment option. Surgery for kidney cancer broadly encompasses two separate types of operations – radical nephrectomy, in which the entire kidney is removed along with the tumor; and partial nephrectomy, which entails the selective removal of the cancerous portion of the kidney while sparing the rest of the kidney. Radical nephrectomy may be necessary in situations where the size of the tumor is large (typically more than 7 cm in greatest dimension) or when the location of the tumor makes it impossible to remove the tumor safely and completely without removing the entire kidney (as in the case of a tumor situated very close to the main blood vessels of the kidney). The removal of the entire kidney however, comes at a cost. The decrease in overall kidney function causes an adverse impact on the cardiovascular system and increases manifold, the chances of life-threatening complications later in life, such as heart attack and stroke. Moreover, in the long term, the chances of kidney failure and dependence on dialysis also increase significantly. While radical nephrectomy may be inevitable in certain situations, most of the smaller and early stage tumors can be dealt with by the removal of the tumor itself while leaving the rest of the normal kidney behind (partial nephrectomy). In fact, it is universally acknowledged by all major cancer guidelines and medical associations that a partial nephrectomy achieves equal cancer cure for smaller tumors (<7 cm) as compared to a radical nephrectomy. At the same time, it enables the preservation of the maximum amount of normal kidney tissue and decreases the chances of heart attacks, strokes and dependence on dialysis. So overall, patients with small tumors in the kidney are likely to live longer, healthier lives if they choose to undergo partial nephrectomy rather than a complete removal of the kidney. Though there are a number of ways of doing a partial nephrectomy (open, laparoscopic and robotic), robotic surgery has recently completely transformed the landscape in this type of kidney cancer treatment. In a number of major cancer centers in the western world, robotic surgery is now being used to perform over 90% of the total partial nephrectomy surgeries performed. Robotic surgery is also being increasingly used for kidney cancer treatment in India. The advantages of robotics in this operation are clear – excellent vision and dexterous fine instruments enable precise removal of the tumor and reconstruction of the remaining kidney with superior results and decreased complications. Since the operation is performed through small “keyhole” cuts without the need of a big open incision, the patient recovers faster, has less pain and is able to become fully active much earlier than conventional open kidney cancer surgery. Moreover, blood loss during the operation is significantly reduced and over 95% of patients do not require any blood transfusion thereby decreasing the transmission of blood borne infections. The technology however doesn’t come cheap. The purchase and maintenance of the robot carries a cost, which invariably finds its way into the patients’ hospital bills. Using the robot inflates the cost of kidney cancer treatment in India by about 30% but some of this increased cost gets offset by the early discharge and less medications required after the operation. The chances of requiring readmission to the hospital also decreases, thereby decreasing the overall cost of kidney cancer treatment. As the awareness regarding robotic surgery spreads in the country and as more and more robotic systems are installed in the top cancer hospitals in India, it is inevitable that an increasing number and types of procedures will be performed with the help of this technology. Already the robot is being used in a variety of different surgical specialties including gynecology, head and neck surgery and cardiac/thoracic surgery. This is only going to increase in the future. All this should translate into a significant improvement in the surgical care that is currently available at our medical institutions and enable surgeons to provide a relatively pain free, safe and effective solution for a gamut of diseases. There is however, one important caveat that must be borne in mind prior to undergoing robotic surgery. Like any new technology, robotic surgery has a definite learning curve and requires specific training and experience in this modality. It may take up to 200 cases for a surgeon to become proficient in robotic surgery and become comfortable with this interface, which is completely different from open and conventional laparoscopic (“keyhole”) surgery. Although the technology is superlative, it is the man behind the machine that delivers the results. This blog has been written by Dr. Gagan Gautam, head of urological cancer surgery and robotic surgery at Max Institute of Cancer Care, New Delhi, India. Dr. Gautam is the leading specialist for prostate, urinary bladder and kidney cancer treatment in India and is an expert in robotic surgery for these conditions. His institution is an 800 bed referral center recognised as one of the best hospitals for cancer treatment in India. It is equipped with state of art technological equipment including the Da Vinci Xi HD robotic system which is used by Dr. Gautam to advance the role of robotic surgery for the treatment of kidney cancer in India.